When you want a classic straw hat, this hat is about as classic as it gets. With a broad brim, it offers 360° sun protection, while their handsome straw design keeps the head cool and well ventilated. What sets this straw hat apart from many others is that it has material under the brim, which helps wick away moisture. It has a dipped edge top with a rounded centre. The sides are slightly upturned giving it that slight cowboy look. This hat comes in white only, with a choice of hatband colours, so you can find the colour that best suits your logo. Available in two sizes - S/M, X/XL. Anyone would look good in one of these hats -- and they'd look even better with your logo on the band. These stylish but comfortable hats make great items for promotional sales. They're just right for gift-shops in businesses in hot, tropical or sea-side locations. 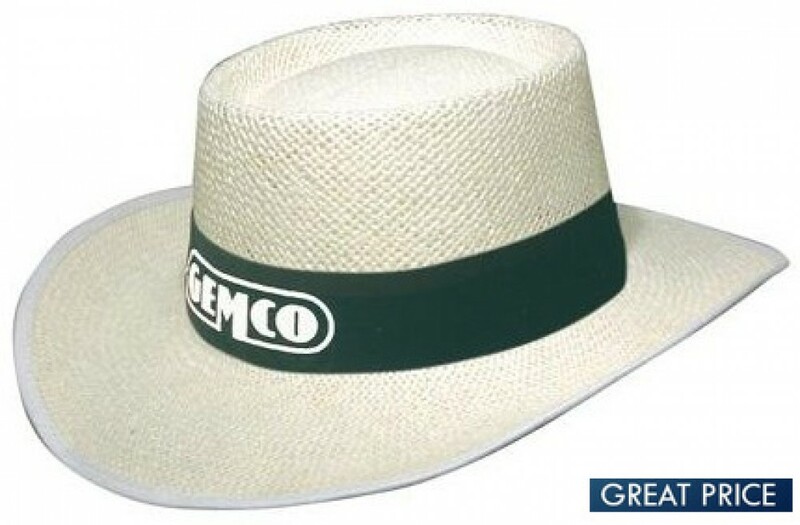 Anywhere your customers will want a comfortable hat for superior sun protection, there is an opportunity for selling handsome hats that enhance your brand. Wherever your organisation is in Australia, we will deliver to your door. Our experienced freight contractors will deliver to all states and territories of Australia -- New South Wales, Tasmania, Victoria, Queensland, South Australia, Western Australia, the Nothern Territory and the Australian Capital Territory. We cannot deliver outside of Australia, or to PO boxes. If you need a rush order, or you are making an unusually large bulk order, this may affect delivery time and cost.